This article was originally posted on Rich Uncle Rupert in 2017. It is presented here without editing or modification from the version which was published. 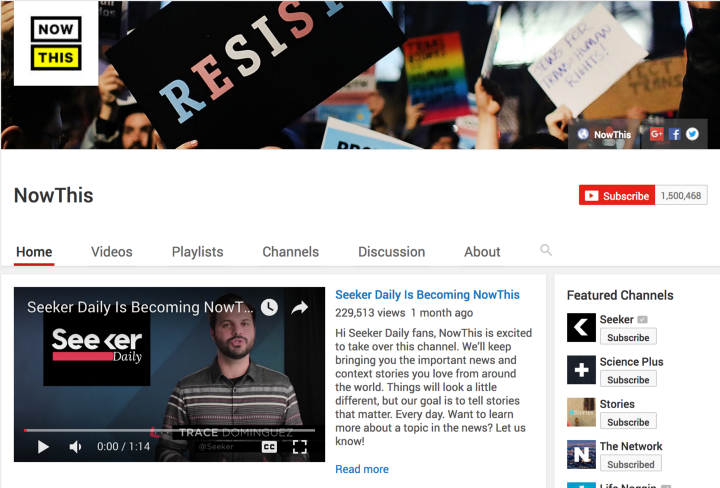 Over two months after Group Nine Media controversially rebranded YouTube news channel Seeker Daily in keeping with their NowThis brand, the channel has gone dormant. The channel has not published videos in over a month and 15 days. The channel previously uploaded near-daily. The average approval rating of the channel’s videos experienced a sharp drop from ~80% to a staggering 14% in just under a week. View count has also fallen. Last month, NowThis brought in 9.42 million views. A drop of over 3 million views. It would seem that the channel’s subscriber continued growth is being driven by its older videos. A large segment of Seeker’s audience immediately voiced their concerns that a NowThis channel would be more overtly liberal-leaning than its predecessor. Others denounced NowThis’ back catalogue (found mostly on Facebook) as Buzzfeed-style clickbait and were concerned that the high standard of journalism they were used to would be lost. Especially as fan favourite hosts such as Vice’s Jules Suzdaltsev were being replaced with people seen as other. On that note, Suzdaltsev has launched his own independently-run Seeker-style show entitled Need to Know News. Many of Seeker Daily’s hosts also hosted DNews which was also confusingly rebranded as Seeker.